I was so excited when I received an email from Printcopia about reviewing a product. Naturally, I chose to have a 16 x 20 printed of one of Luis's beautiful photos. My plan was to hang several beach photos we took of the children as well as some seascapes, so this was my first choice, and I was not disappointed! 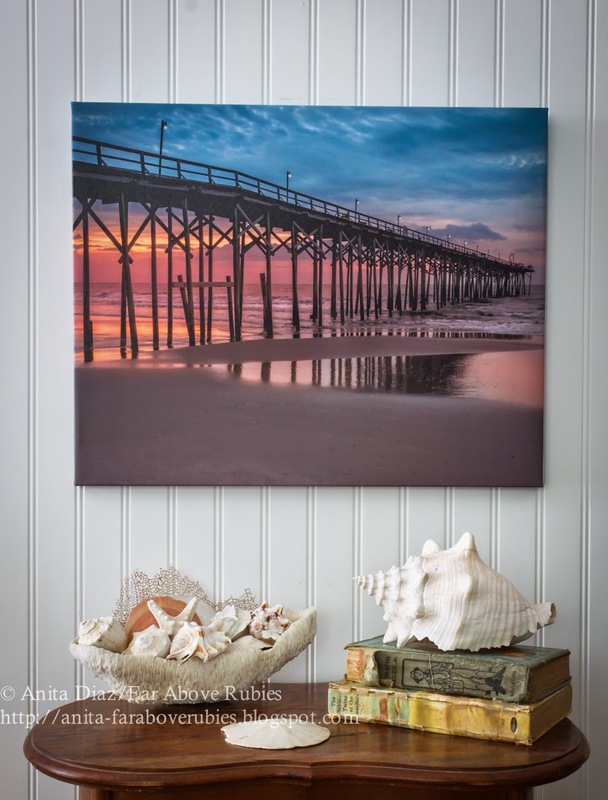 This gorgeous sunrise shot he captured of the Carolina Beach pier just took my breath away, and I promise it is even more beautiful on a canvas. I was so pleased with how easy the process of uploading a photo to Printcopia was. It took a little over a week to get the canvas and I'm very pleased with the quality of printing and materials. The canvas is wrapped very tightly around an MDF frame and comes with hanging hardware already attached. Also included is a nail and picture hanger. The photo also turned out exactly as it looked on the computer, which is so important to us. I am excited to have been able to work with this company, and know you will be very pleased if you use their services for photo printing. They always have some kind of special deal going on their web site, so be sure to check it out. The 16 x 20 canvas was provided by Printcopia, and the opinions expressed here are entirely my own. That is so beautiful, you can just smell the surf. Beautiful, Anita! Luis's photography is stunning!